The 458 SOCOM cartridge offers the practical ballistics of the legendary .45-70 in a modern AR platform rifle and is capable of firing 250 to 600 grain .458 caliber bullets in a lightweight, controllable package. For hunting medium to large game, bullets in the 250 grain– 400 grain weight range possess devastating killing power. We have found that the .458 SOCOM offers peak downrange performance when firing the purpose built Barnes 300 grain TAC TX bullet in the 1750fps – 1800fps velocity range. The 1-22 twist rate is an absolute tack driver with 250gr – 325gr bullets commonly used for hunting and is the optimum choice for the Barnes 300gr TAC TX/TTSX SOCOM bullet. The industry standard 1-14 twist barrels seem to be the best choice for over 350 grain bullets and/or subsonic loads and will shoot all suitable bullet weights acceptably well. We recommend this twist rate if you plan to use a suppressor to eliminate the chance of a baffle strike. 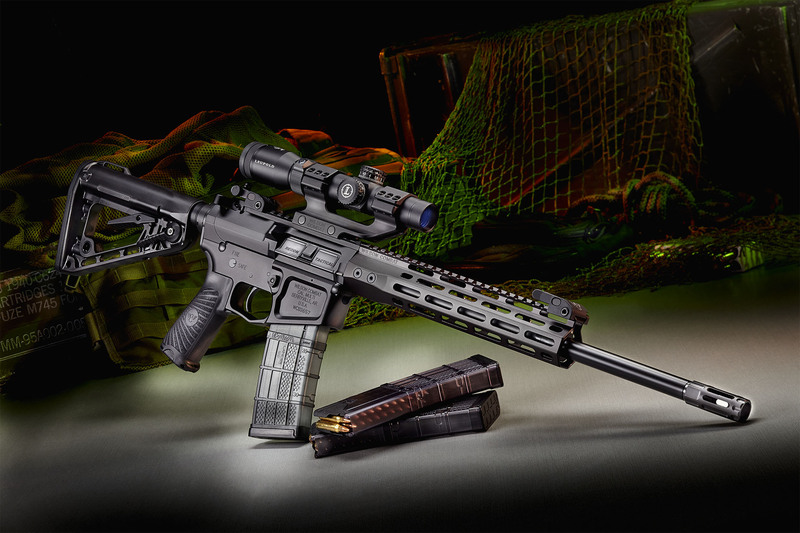 Building the .458 SOCOM takes only two caliber specific parts-a .458 specific bolt and barrel- Wilson Combat is further optimizing their .458 SOCOM rifles by adding an adjustable gas block, extra power action spring and straight gas tube as a standard reliability upgrade. Having the ability to easily adjust your gas volume allows the end user to fine tune their carbine’s bolt velocity for a specific load’s power. Minor machining has also been performed to the ejection port opening of the upper receiver to allow clearance for the larger cartridge. The .458 SOCOM feeds flawlessly from many standard unmodified 5.56 AR magazines. Our extensive testing has found the Lancer L5 AWM magazine to be optimal for this round. The Lancer 20 round 5.56 magazine holds seven SOCOM rounds and the 30 round 5.56 magazine will hold nine. The .458 SOCOM achieves optimum ballistic performance in barrel lengths shorter than 16” so there is no need for longer, less portable barrels.